It is super important to take care of your metal roof in order to make sure it has a long life. Metal roofing manufacturers suggest spending one weekend a year to power wash any dirt and organic matter off of the seams and channels. Barring any unforeseen damages, a good washing is all of the maintenance your metal roof should need for many years. Sometimes, if a roof gets damaged it may need one or more panels replaced. When doing this, you will need to open two or more side lap seams in order to guarantee that the damaged panels be removed and replaced. If this is the case, panels that are secured by three-piece seams have the advantage since the panels on either side of the damaged panel will hardly be disturbed at all. You should cut the cap for the three-piece seam along the complete length with the appropriate metal roofing tools. Then, lift out the damaged panel and lay the new panel it its place. Apply a brand new seam cap to finish. Panels which are secured by two-piece seams are normally much more difficult to replace without disturbing the other adjacent panels. 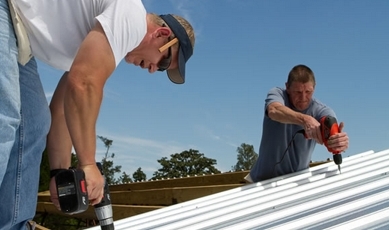 Having the correct metal roofing seaming tool will be key in this process. When the damaged panel is removed, lay the new panel in its place and reseal the seams on either side of new panel. If this is done correctly, you should not be able to tell that a new panel was installed except for the color or cleanliness of the new panel. After a good rain your roof should look like it always has in the past. If you are on a tight budget, re-coating a corroded or badly weathered metal roof is more economical than completely replacing your roof. The re-coating process requires that any peeling paint and loose, heavy corrosion be removed by either wire brushing or blasting. The whole surface of the roof should then be thoroughly cleaned. Use a cleaning solution suitable for the original finish and permit the roof to dry entirely. As you can see, if you have a metal roof, maintaining it is super easy – especially if you have the right metal roofing tools!